ALEX: Tell me about your problem. FEDS: We’re working on some documentation we’re going to use against your company in the Appellate Court in a few weeks… but before we can finish, we need to figure out how to turn off the auto-correct feature. 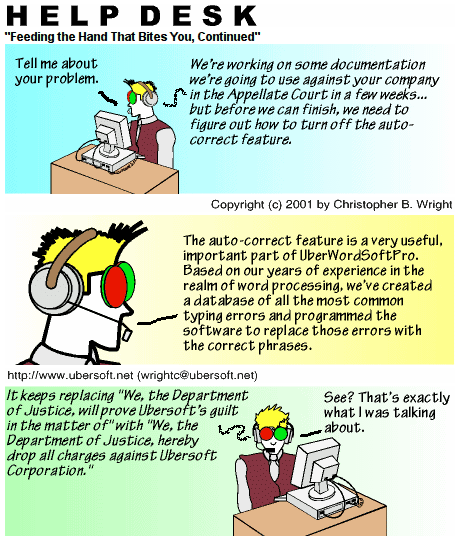 ALEX: The auto-correct feature is a very useful, important part of UberWordSoftPro. Based on our years of experience in the realm of word processing, we’ve created a database of all the most common typing errors and programmed the software to replace those errors with the correct phrases. ALEX: See? That’s exactly what I was talking about.